One of the great classic works of SF. The title is part of a line from a play (“The Maid of Orleans”) by the German poet Friedrich Schiller: Against stupidity the gods themselves contend in vain. In Part II, The Gods Themselves, we find ourselves in that “para-universe”. This is a stunning creation and the book should be read to experience this other world if for no other reason. It is so, so different, yet so, so believable … and yes, of course, the stupid rule the roost there, too. In Part III, we are on the Moon – our Moon – and again the book would be worth reading just for this depiction of what life on the Moon might be like. This Part is naturally entitled “Contend in Vain”, but with an important question mark: Contend in Vain? 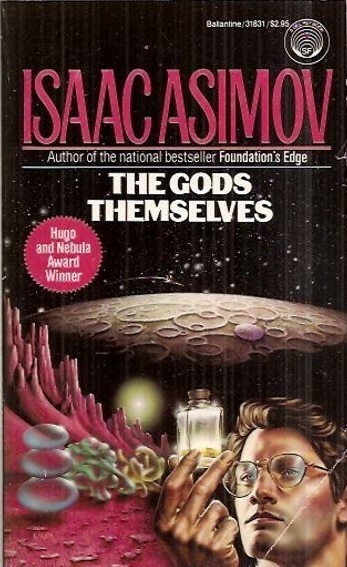 It would be too easy to spoil this wonderful story, so I will simply finish by saying how happy I am to have rediscovered my early love of Isaac Asimov (my grandmother had all his books) and that I plan on re-reading many more of them.